In my first year of teaching I felt all kinds of inadequacy, especially when it came to teaching readers. It seemed we had such a long way to go from the beginning of first grade to the end...so many levels to jump! And more importantly, I wanted my students to have meaningful reading experiences that built confidence and gave them joy. I LOVE reading and I wanted my kids to have some kind of arsenal of tools that they could turn to as they approach those tricky words rather than feeling frustrated and overwhelmed. Over the past four years I have fine-tuned the reading strategies that I present to my kids. The animal reading strategy idea is nothing new, but I have found it to be particularly helpful to my students so I've just tweaked and added to it. 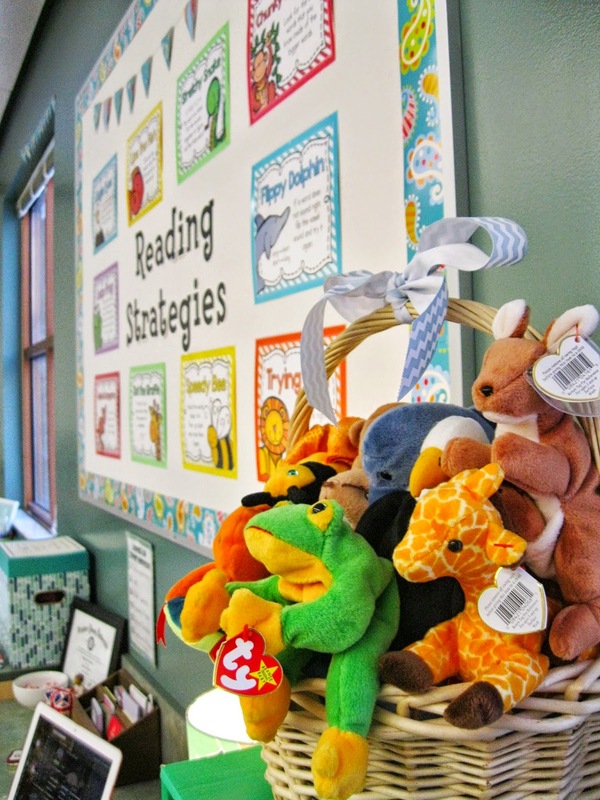 The animals and the names are catchy enough to be remembered so I created a pack of reading strategies resources to be used throughout the year. 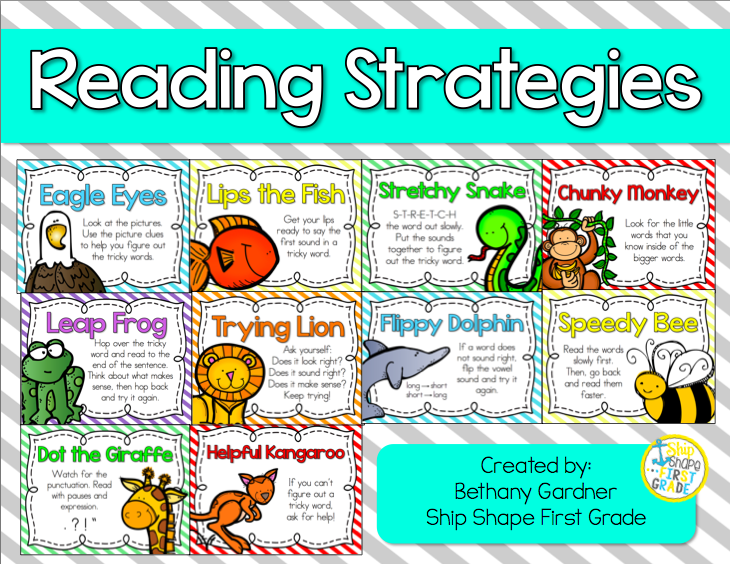 I know it may seem a little late in the game to talk about beginning reading strategies, but while I do initially teach them at the beginning of the year, we constantly review them throughout it. The students apply them in different ways as they progress to more challenging texts. These decoding and comprehension strategies are each matched up with an animal. At the beginning of the year I teach one strategy per week and we continue practicing them in guided reading and shared practice. The posters included in the pack become part of a permanent bulletin board for my kids to refer to throughout the year as needed...and they do every single day! I'm not sure what it is about puppets and stuffed animals, but there is something engaging about pulling one out at the beginning of a lesson. My first graders love these guys! These are just Ty Beanie Babies that I pulled from my childhood (and a few from Amazon!) that help me introduce a new reading strategy to my kids. The packet also includes these fun little cards that I give to my students to take home when I finish teaching and modeling a strategy. They are so enthusiastic about these! The next day I have them report back about their experiences showing off their reading strategies. I've also included a parent letter that I send home at the beginning of the year or at Back to School Night. It briefly explains the purpose of the animal reading strategies and gives them something to reference as their children practice these strategies at home. The packet also has mini versions of the animal posters. 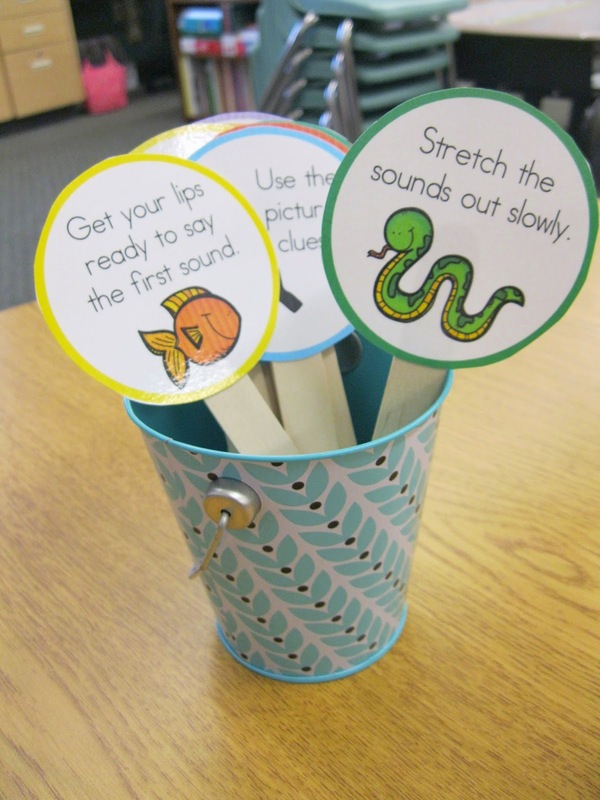 I keep these at my guided reading table and pull them out for quick reference or impromptu practice as needed. These circle versions are a favorite with my kids. Each has an abridged version of a strategy. My kids can come and borrow a stick during their independent reading time to help them try out a new strategy or simply remind them that they have tools to help out with those tricky parts! In addition to all of that, I give my kiddos these fun bookmarks. I don't know what it is about kids and bookmarks, but the enthusiasm it garners for reading is something I wouldn't turn away! If you are interested in purchasing this packet click here or on the picture below. It will be discounted until January 17th! Happy Teaching!